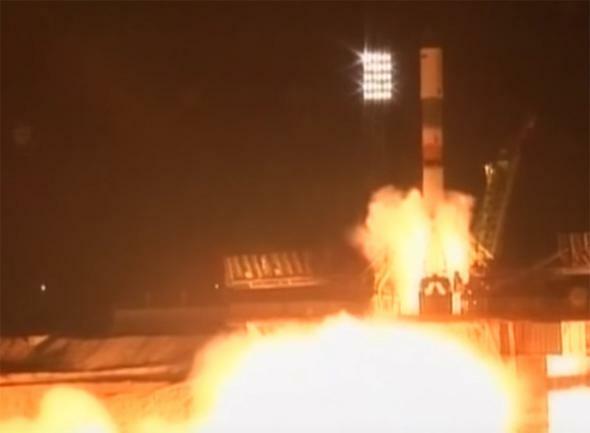 Russian ISS resupply rocket lost during launch. The Soyuz rocket at the moment of launch on Dec. 1, 2016; the upper stage failed and was lost about six minutes later. News is still coming in right now, but it looks like a Progress capsule loaded with supplies for the astronauts on the International Space Station was lost as it was heading up into space this morning. It was uncrewed, so there was no loss of human life. Jason Davis at The Planetary Society has details, and you can also get more at SpaceFlightNow. The launch started off well, but the third stage cut off prematurely. Contact was lost a little over six minutes after liftoff, and Roscosmos, the Russian space agency, has confirmed the loss of the vehicle 190 kilometers over the Tuva mountains in south central Russia; the Progress capsule lost altitude and burned up in the atmosphere. There are unconfirmed reports of debris in the remote area as well though no injuries reported. The good news is that the ISS is well stocked, and a Japanese supply ship is due to launch in a week or so, so the astronauts are in no danger. I’m keeping my ears open for more news; it’s unclear how this will affect future Russian launches, including astronauts to ISS. I’ll note SpaceX just announced their return to flight mission for a Falcon 9 on Dec. 16; this will be their first launch since the pre-launch explosion of a Falcon 9 during fueling on Sep. 1, 2016. That’s good news, as they have several resupply missions planned to ISS as well. More info will be added here as I hear and confirm it.